I drove to my parents and we drove to Cinemark in the North Hills. I was so excited to see the Nutcracker and the four realms. I have seen the previews and I couldn’t wait to see the movie. Once we got to the theater, we went through the concession lines. I got popcorn, diet coke, and water. I bought my parents’ popcorn and my dad some candy. My mom wanted a drink and daddy wanted a coke. Not a problem I was treating them since it was my dad’s birthday. Once we approached the box office, the usher scanned my phone. The tickets were on my phone. My parents were so amazed by that for some reason. 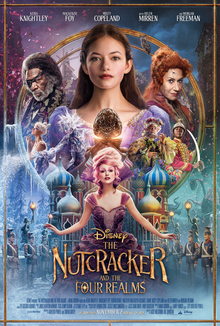 Once inside the theater, we took our seats and once the movie started, and I heard the familiar Nutcracker Suite started to play, and I was immediately in love. Something about the Nutcracker really gets me into the Christmas spirit. When I was younger, my mom took me to see the Nutcracker for a few Christmases in a row. It was just a magical tradition for me as a little girl, the ballerinas, the grace and the beauty. Also, I took ballet lessons as a child (up until I was 15 years old). I think I wanted to be a legit ballerina. After the movie, which was everything and more than I could have hoped it would be. I had to stop and use the restroom on the way out of the theater. After I finished my business, I stayed in the stall a few extra minutes and checked to see if my grade for my paper was posted. I was so nervous about it. I wanted to do well, and I had the TA look it over, so I felt confident, but something was bugging me about it for some reason. Courseweb finally loaded, I saw that my grade for a paper was a C. I was one point away from a B-. I was going to have to rewrite. I was so upset. I cried. When I got out of the bathroom, I told my parents. They felt so bad for me. They knew how hard I worked on it. They knew I sought help and yet still I got a C. I texted Drew and he felt so bad for me. I told him that I was probably going to have to rewrite. He told me that I should rewrite and just accept it. I was still going to pass since I did well on all my other assignments. I was still so upset. I just wanted to go home, but I had an appointment at the Apple store in Ross Park Mall. When we arrived at the mall, I checked in at the Apple store. They said it would probably be about 2 hours. My parents had to go home and feed the dogs, so I just stayed behind. I didn’t want to be there, but I wanted to be alone. I was in such a bad mood. I just wanted to see my husband. I was dreading having to rewrite this paper, but I felt as though if I did rewrite, I would be in a better place with my grade going into the final paper. When I finally saw my husband, I gave him a big hug. I wanted to cry. I held back tears in the Apple Store. Finally, my phone was complete all I had to do was get my battery replaced. I was so glad to go home and get out of there. When I got home, Drew and I talked and he was so supportive and didn’t think I needed to rewrite but supported my decision too. I had to get a plan of attack together. First, I needed to talk to the TA tomorrow, and see what I need to do to improve. I was so anxious for class the next day.